Comfortably sandwiched between two roll neighbours, Kareem's and Ayaz's rolls, we found a rather unusual restaurant on 16th Road in Bandra- Farmer's Cafe. Comfortably sandwiched between two roll neighbours, Kareem's and Ayaz's rolls, we found a rather unusual restaurant on 16th Road in Bandra- Farmer's Cafe. 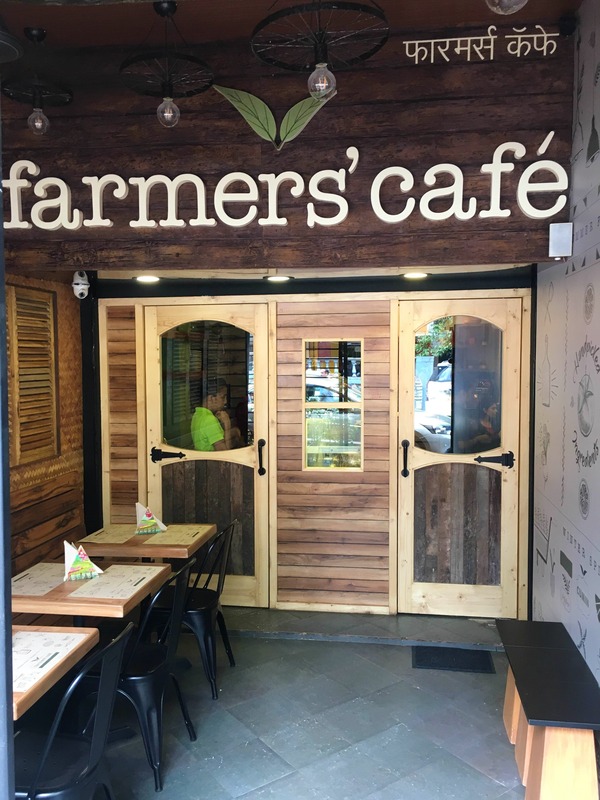 Farmer's Cafe is a very unique offering to the foodies in the city. They're serve everything organic, healthy and straight from the roots to the table. The brainchild of Minali Gaba, it is the perfect place to hangout for someone like me, who loves the company of a Neil Gaiman book and no one else to go with it. Their menu has a vast variety of gluten-free food, vegan food and organically produced food. What I loved was their all-day breakfast menu that includes healthy granola bowls, egg dishes and pancakes- all under INR 200. We're sure they know how much all of us love pizzas; they have an entire section for pizzas (including vegan pizzas), pasta, mains too. I opted for the Farmer's Pancake and the Cucumber chaas. I loved the freshness, thickness of the chaas and the cherry on the cake was the sprigs of mint mixed well with the chaas. The pancake was healthier than I expected and more like a mini paratha but I did feel infinitely healthier after eating it - do use the dip generously. Though the space might not be suitable for dining in large groups, if you're two, three or just solo, it is the perfect spot to enjoy a hearty meal that is tasty too! There's a bakery counter too that serves gluten-free cookies, cakes and dessert for all your sweet cravings!